Happy New Year! I hope you all had a great Christmas. I certainly did, and I'll share some pictures of it soon. For now, here are some pictures of the last projects I finished in 2014. These are the ornaments I made for the boys this year. You can read about the ornament tradition here. Aiden decided this year that he is interested in sports, especially football. Following his usual fashion, he has become completely fascinated and loves reading stats, historical facts and whatever else he can get his hands on. 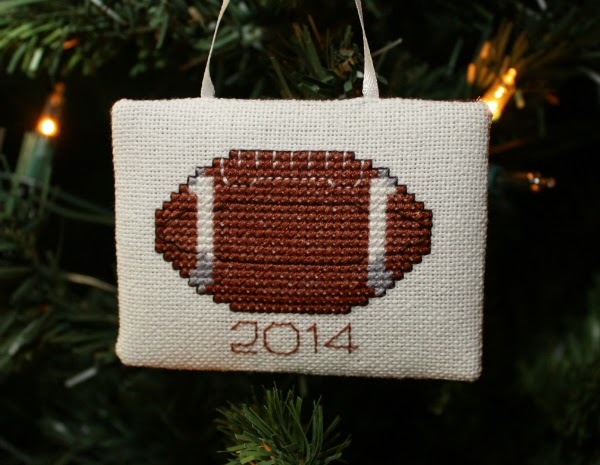 So, it was pretty easy to come up with his ornament, and he and Zachary had figured this one out before Christmas. Zachary has been interested in soccer for a while now, and his favourite shirt is a soccer jersey Uncle Adam and Aunt Sandrine brought him from their visit to Chile. This year he picked a favourite team in the MLS (LA Galaxy), and started following them a little. 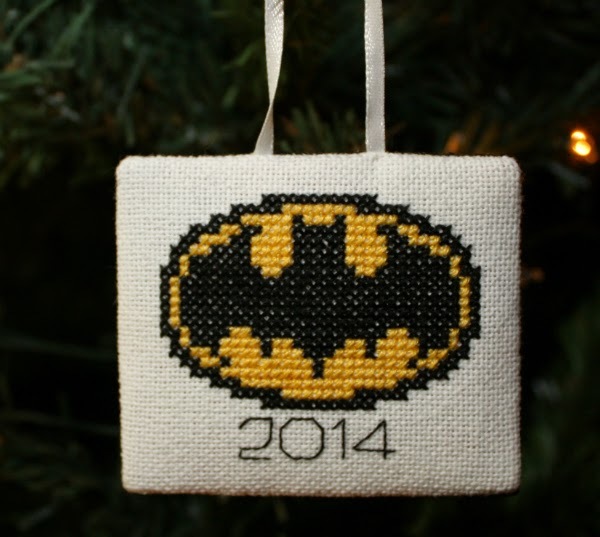 So his ornament was also easy, and they had figured this one out too. 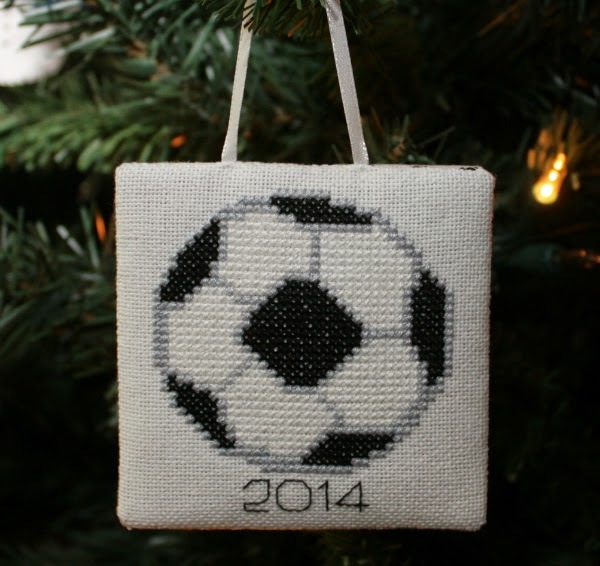 Nathan didn't follow his brothers and pick a favourite sport this year, so his ornament is altogether different. His obsession has been anything and everything superhero. I asked who his favourite superhero is and he named someone I'd never heard of, so I had to narrow things down a little. When I asked who he likes more, Batman or Spiderman, he picked Batman. That I could work with! So that's the last of my finishes for my Finish-a-Long list for Quarter 4. Four finishes of the nine projects I listed isn't too bad, I suppose. And once again, the list for next quarter will practically write itself! Thanks to Katy at The Littlest Thistle for running the Finish-a-Long for 2014. It's been fun! 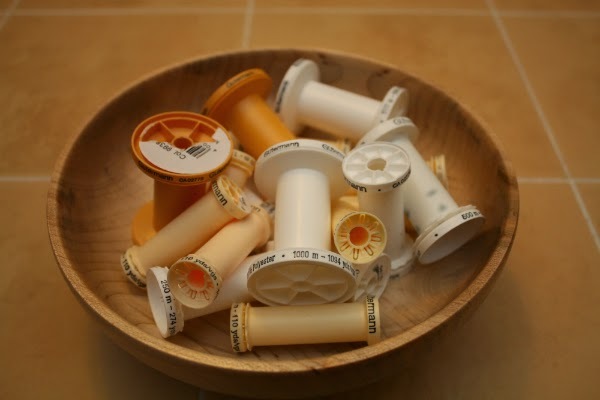 And, since the year is over, I counted up my empty spools for 2014. 17 this time around, and some of those were fair sized spools. But, according to this post, I emptied 27 spools in 2013 so apparently I have no consistency whatsoever. Time to start collecting spools again for another year. Considering I've started using huge cones from Connecting Threads, I have a feeling my number will be pretty low for 2015. I'll be impressed if I manage to empty any of those cones! Such a sweet tradition, and I love how your boys are so interested. That is a wonderful tradition, and how fun that they work to get it "figured out". :) Also, very cool tradition to count spools... do you then just throw the spools away or do you have projects in mind for the empty and year old group?